Aiming to encourage and support a prosperous, safe and healthy local community and a sustainable environment for all. 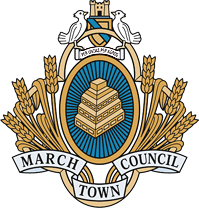 Telephone: 01354 653709 - Email: marchtowncouncil@btconnect.com - The offices are open: Mon-Wed. 8am – 4pm, Fri. 8.30am – noon. We hope you find this web site informative and useful. If you have any suggestions as to how it could be improved please let us know — we would appreciate your comments.